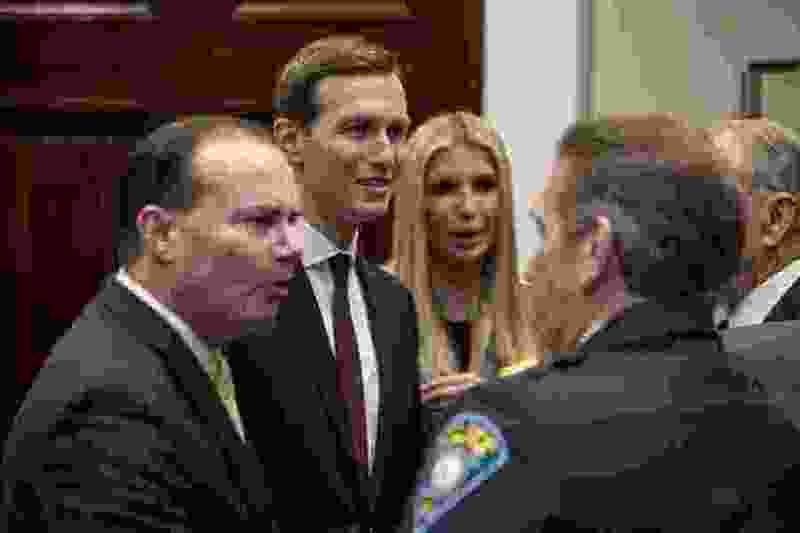 (AP Photo/Andrew Harnik) From left, Sen. Mike Lee, R-Utah, President Donald Trump's White House Senior Adviser Jared Kushner, and Ivanka Trump, the daughter of President Donald Trump, greet guests after President Donald Trump speaks about H. R. 5682, the "First Step Act" in the Roosevelt Room of the White House in Washington, Wednesday, Nov. 14, 2018, which would reform America's criminal justice system. Washington • In one of his biggest legislative achievements, Sen. Mike Lee’s push to reform the criminal justice system passed the Senate on Tuesday night, a clear victory on bipartisan legislation backed by President Donald Trump and advocates on both sides of the aisle. The sweeping legislation would overhaul the federal sentencing system to lower mandatory minimum sentences for drug crimes, expand job training and boost early-release opportunities. It also reduces the unequal standards applied to whether someone is caught with crack or powder cocaine. Current law mandates a longer sentence for possession of crack cocaine, a point that advocates say disproportionately affects black Americans. We did it. We passed real bipartisan criminal justice reform. Thanks to the hard work of my colleagues, American families will be stronger and our communities will be safer. This is a huge win for America and President @realDonaldTrump. The House plans to vote this week to approve the same legislation after passing a similar bill previously. Trump, who has been pushed by his son-in-law and aide Jared Kushner to back the measure, is expected to sign it. Sen. Orrin Hatch, R-Utah, also supported the revised bill, called the First Step Act. The passage of the bill was notable in its bipartisan support. While Congress is currently unable to pass a budget, possibly setting up a government shutdown on Friday evening, the First Step Act had solid support from conservatives and liberals. Lee co-wrote the bill and has been one of its most vocal cheerleaders in the Senate, helping convince GOP leaders to bring the measure up for a vote. Senate Majority Leader Mitch McConnell had kept the bill in limbo until a full-force effort by the White House and Democrat and Republican senators in the final days of the congressional session. The legislation, which has been mired in a political fight for years, had the support of former federal prosecutors and minority activists as well as hard-line conservatives, a nexus not often found in Washington these days. In addition to other reforms, the bill would reduce the federal “three strikes” penalty down to 25 years versus life in prison and is aimed at reducing the burgeoning prison population since the last overhaul in the 1990s. Trump tweeted minutes after the bill passed saying he looks forward to signing the bill into law. “America is the greatest Country in the world and my job is to fight for ALL citizens, even those who have made mistakes,” Trump said. “Congratulations to the Senate on the bi-partisan passing of a historic Criminal Justice Reform Bill. “This will keep our communities safer, and provide hope and a second chance, to those who earn it. In addition to everything else, billions of dollars will be saved,” Trump continued. Sen. Patrick Leahy, a Vermont Democrat and former Senate Judiciary Committee chairman, said the bill's passage was a major victory in reforming the criminal justice system for the first time in nearly a decade. The system, he said, should be about returning “ex-offenders” safely back into the community and not just locking them in prison. The First Step Act was backed by the groups ranging from the ACLU to FreedomWorks, the American Bar Association, the American Correctional Association, The Prison Fellowship, the American Probation and Parole Association and The Sentencing Project. But it was opposed, in its current form, by the National Sheriffs' Association, the Major Cities Chiefs Association and the Major County Sheriffs of America. The passage of the bill, and a promise by Trump to sign it, is one of Lee’s most signature accomplishments in his eight years in office. He also sponsored and pushed reforms to the Patriot Act through his USA Freedom Act that ended the National Security Agency from collecting and keeping bulk data about Americans' phone call records.